Adrian Tomine has a clean, simple and elegant style of art, one that goes well with The New Yorker. This book has illustrations he created from 1999 for the magazine, and also some unpublished works that includes a few comics and a few sketches he did on the subway. While some pieces capture scenes of New York, the rest are more editorial illustrations. The art is beautiful. I like the toned down use of colours, the strong black and lovely line work. He has a rather timeless style. Some drawings really work, such as the one on the cover. Two strangers look at each other after realising they are reading the same book while the train they are on are about to go the opposite direction. In this case, the picture is better than what can be expressed in works. The editorial drawings, however, would be much better if the captions had explained the context rather than just giving the story's title. 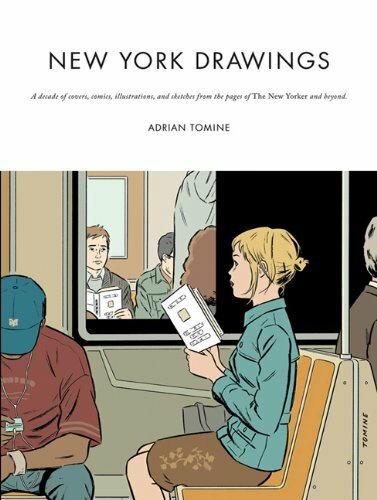 Adrian Tomine's comments are insightful but he only wrote for selected pieces. The layout of the book could be better. There's too much unnecessary white space at times. Several drawings can certainly be printed bigger. Those printed at full height looks so much better, even when printed across the page gutter. I didn't like the publication details are by the side but the captions are located at the back of the book, even when there's enough space on the pages in front. Recommended to those who like editorial art.